New Orleans is hardly the most original place in which to set your supernatural urban fantasy series, but I would be prepared to forgive that if the quality of the story lifted it beyond the ordinary. 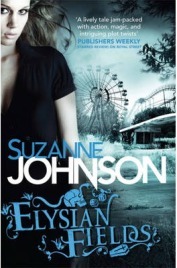 In Elysian Fields, Suzanne Johnson imagines a world where the force of Hurricane Katrina has ripped a hole in the veil between the human city and the frontier “beyond” settlement of Old Orleans; this was a good start, giving us an intriguing explanation for non-humans to be entering the city in the form of the undead and the more inevitable werewolves, vampires and the like. Unfortunately, after this imaginative opening idea, things went a little downhill for me. Our heroine is Drusilla Jaco – DJ to her friends – a wizard appointed Sentinel of New Orleans, tasked with keeping the human population of the city safe from any preternatural beings who may wish them harm. Elysian Fields is her third outing, and in it she faces the prospect of a nightmare from New Orleans’ past coming back to haunt her city. In 1918-19, a murderer stalked the city, killing people seeming at random and leaving a bloody axe behind him; he was never caught and the Axeman of New Orleans passed into legend. A current series of murders seems to be mimicking the old serial killer – or, as DJ suspects, he is the old killer, come back undead to start all over again, and retreating back to Old Orleans between kills. The rumour is that the “Axeman Deux” is being controlled by a necromancer, and that his kills don’t seem to be as random as they once were – he seems to heading towards DJ herself. I would imagine that combining the supernatural with serial killers is a good way of appealing to a wide audience, and indeed there are plenty of positive reviews about this book around the internet. Admittedly it doesn’t help that I haven’t read the first two books of the series, and this really doesn’t work as a standalone novel given the complexity of DJ’s relationships with those around her (which I gave up on trying to follow very early on as it got too exasperating). The writing is clearly not intended for those without the background reading to appreciate it, given several characters appear, interact with DJ, and then are only introduced the third, fourth or subsequent time their name is mentioned. As a new reader, this left me largely unable to follow chunks of plot as I didn’t have a clue who the people talking, or being talked about, actually were. Hardly good writing in any situation. From the bits of the book that I was able to read, there are bits of promising imagination in between the large chunks of so-so plotting. I would suggest that this is more a book for the young adult market than adult readers, a bit like an Anita Blake novel without the 18 certificate. Personally, I found the book full of cliché (I counted 6 well-worn tropes in the first 3 pages alone) and the writing to be insufficient to lift the story up to something for grown-ups to find worth reading. For example: “I might be a wizard, but I had enough elven genes from both of my parents that I’d won the freak lottery and ended up with some elven magic as part of my repertoire – part of which was the ability to sense the presence of preternatural energy”. Really? You’re not just a wizard, but a wizard who happens to have convenient elven DNA that helps you solve these crimes? How lucky is that! Sorry, but not a series to be recommended by me. No Comments on "Elysian Fields"